The mission of the International Institute of Monetary Transformation (IIMT) is to transform the international monetary system in order to achieve an equitable, sustainable, and, therefore, a stable monetary architecture, both internationally and nationally including prescriptions to increase the monetary, financial and economic viability of poorer countries as they, too, struggle to combat the consequences of the deepening economic and climatological crises. 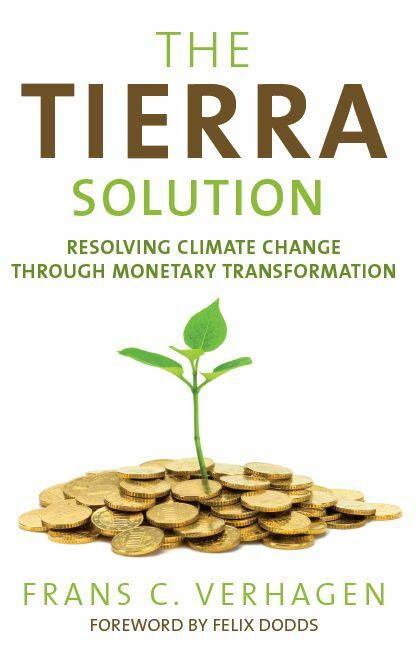 The Tierra Solution is an "extraordinarily innovative" system to deal with the climate crisis by basing the international monetary system on a carbon standard, i.e. a very specific tonnage of CO2e per person. See Amazon.com for the description of the book by the publisher and in two unsolicited reviews. The table of contents shows both the organization and contents of the conceptual, institutional, ethical and strategic dimensions of this visionary proposal. Click for detailed Table of Contents. Money is the creature of law, and the creation of the original issue of money should be maintained as the exclusive monopoly of national government. Money possesses no value to the state other than that given to it by circulation…… The government should create issue and circulate all the currency and credit needed to satisfy the spending power of the government and the buying power of consumers. The privilege of creating and issuing money is not only the supreme prerogative of government, but it is the government's greatest creative opportunity. Money will cease to be the master and become the servant of humanity. Democracy will rise superior to the money power. Abraham Lincoln, Senate document 23, 1865. This progression in the ease of using currencies is not matched with the necessary transformation of the unjust, unsustainable and, therefore, unstable international monetary system. Emissions Reduction Currency System presents one of the many approaches to connect climate change emissions to a monetary instrument, particularly a currency such as is done in www.global4c.org/introduction with its Solar Dollar. The Tierra currency, on the other hand, is part of a transformed international monetary system with its own easily measurable monetary standard of a specific tonnage of CO2e per person, a Tierra global central bank and a Tierra balance of payments system that accounts for both financial and ecological (climate) debts and credits.